This is kind of a cool little item we came across the other day. 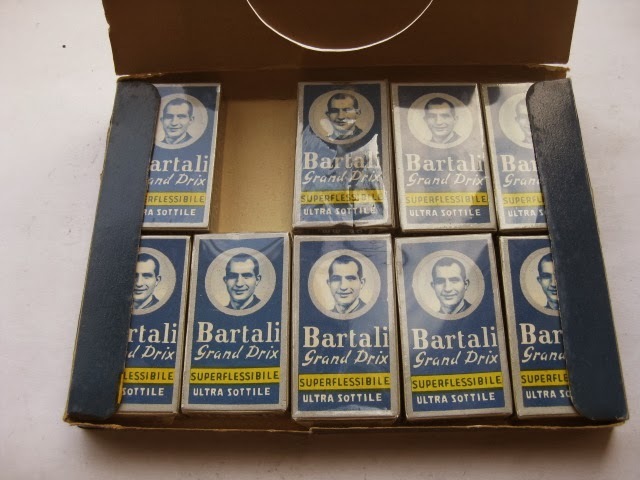 Bartali branded razor blades from the 1940's I believe. 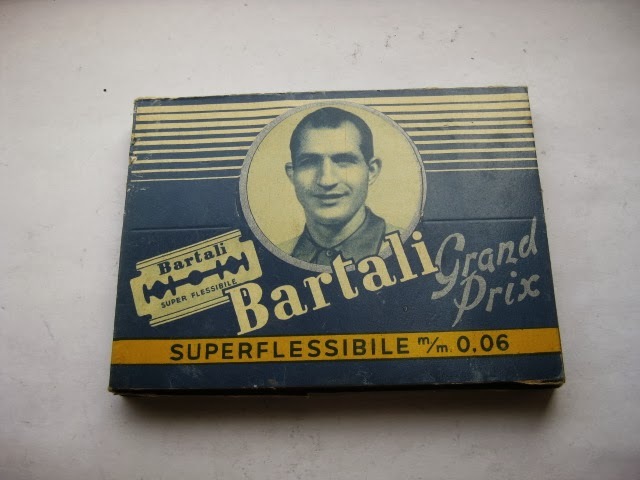 He was a true Italian champion of the pre war period having won the Giro D'Italia three times 1936, 1937, 1946. He also won the Tour De France twice, 1938 and 1948. 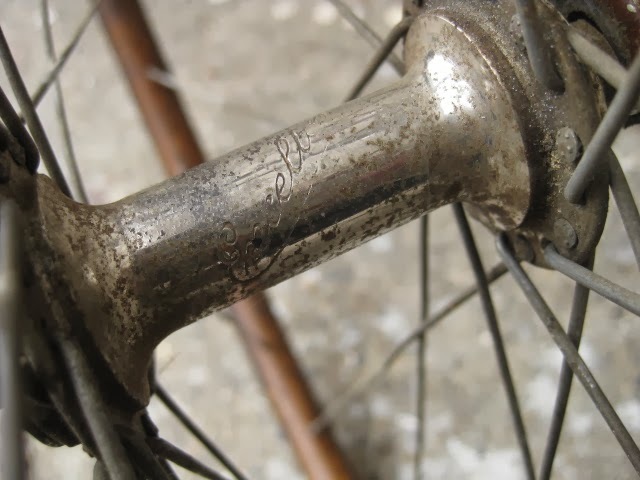 It was not uncommon for cyclists to be associated with everyday items such as this. It made you feel as though you were a champion too! Also of note is the package design, very well laid out and appealing. I see that one package is missing, maybe someone needed a shave! Enjoy! 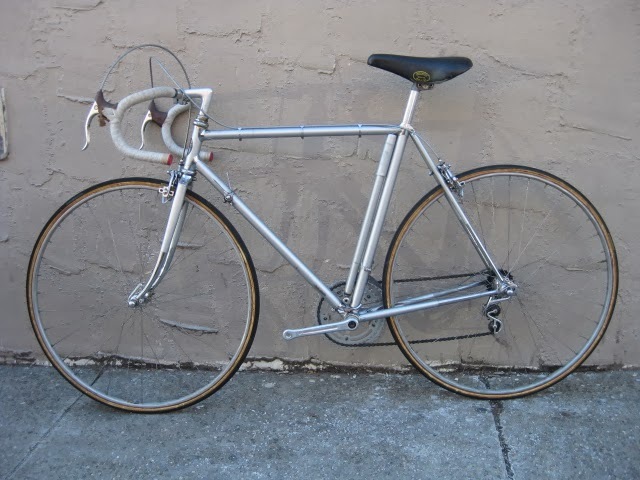 Cool shop bike: early to mid 60's Cinelli S.C.
Todays edition features a really nice early to mid 60's Cinelli Super Corsa (S.C.). 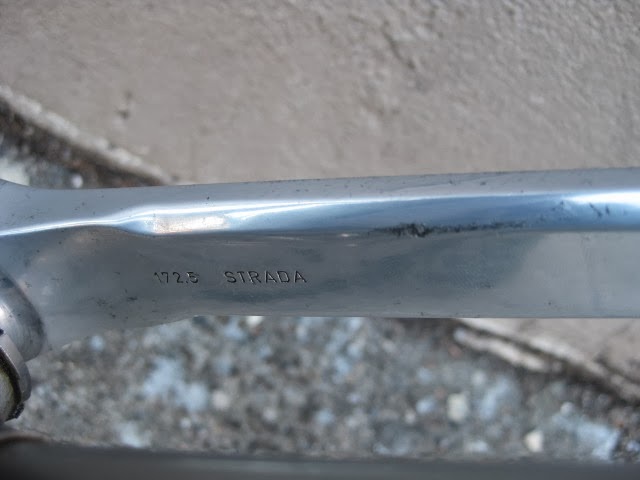 The shop has owned this bike for 10 plus years. Usually it has hung in the office behind me, but it now resides on a rack space out of sight. It is a superb competition machine that looks quite unassuming to the average eye. 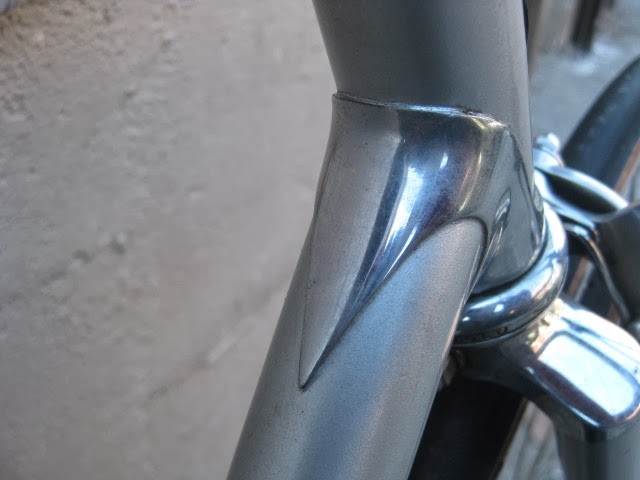 However, one look at the details reveal its pedigree. It is has also been a bit difficult in dating it because some details are inconsistent with the time line. 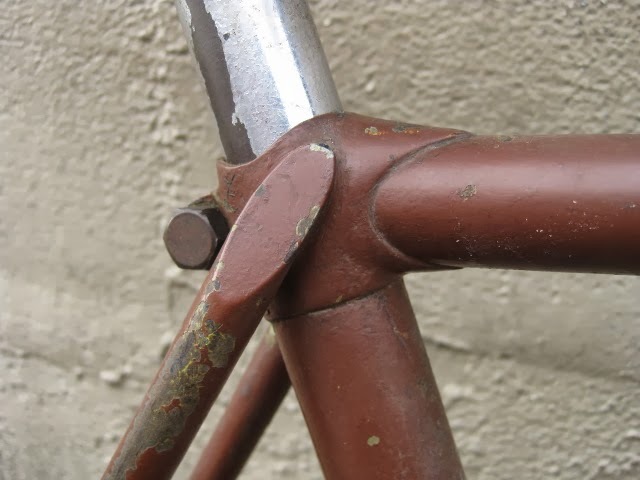 The frame is pre 1968 because of the fact that there are no holes in the head lugs, it also has fender eyelets which were removed from production in the early 70's. 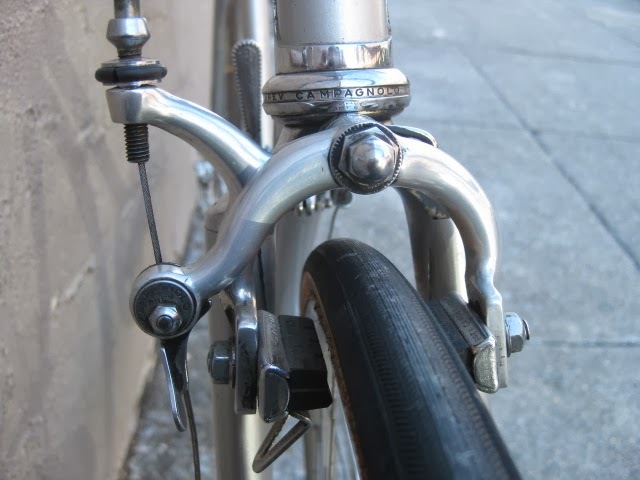 There are no holes in the fork reinforcements (tangs) also which happened in the early 70's. 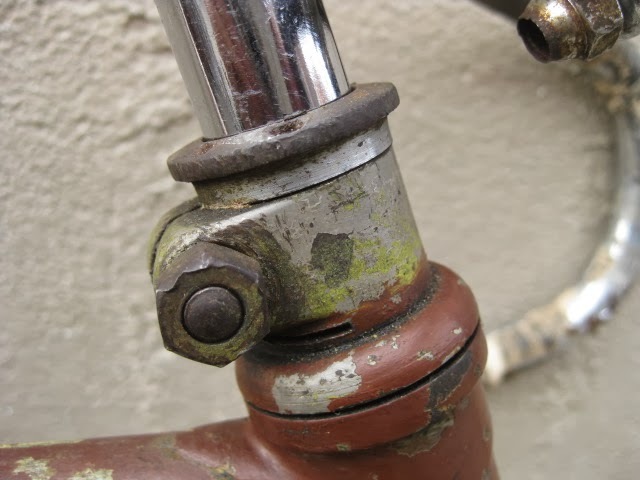 The bottom bracket shell also has an oil port, which disappeared in the mid 60's. 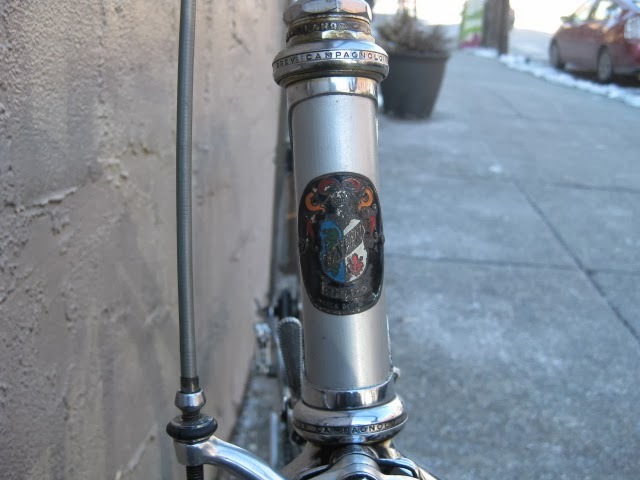 The enameled brass head badge is 51mm tall, which were used between 1958-1971.T he distinctive fully sloping fork crown is seen in Ron Kitching's 1963 catalog. 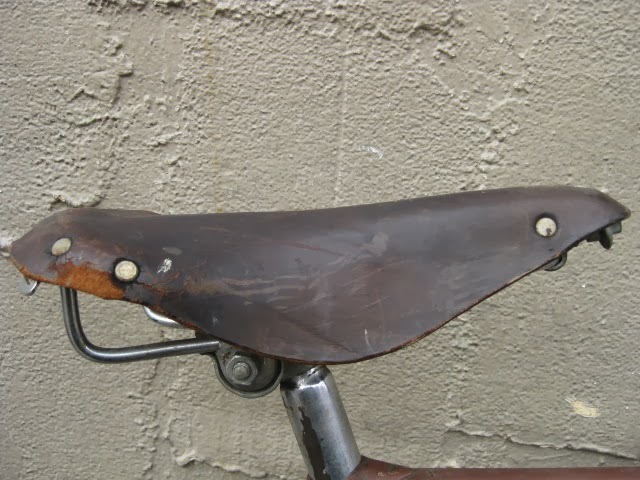 It also has the older two bolt Seat binder attachment as opposed to the later three piece design which appeared in 1972. 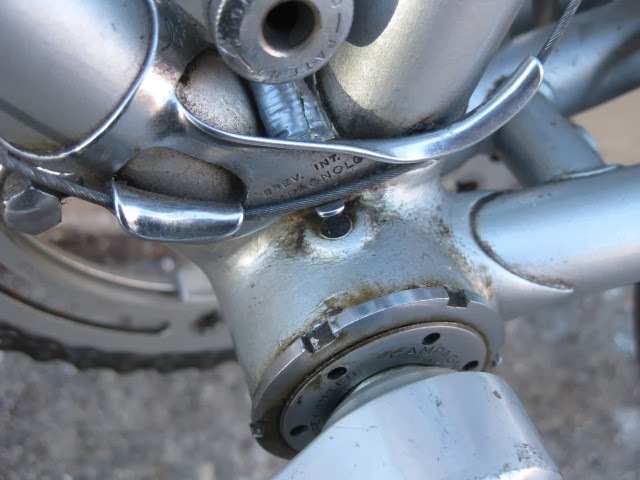 There are also no brazed on cable guides or stops except for the rear derailleur housing stop. 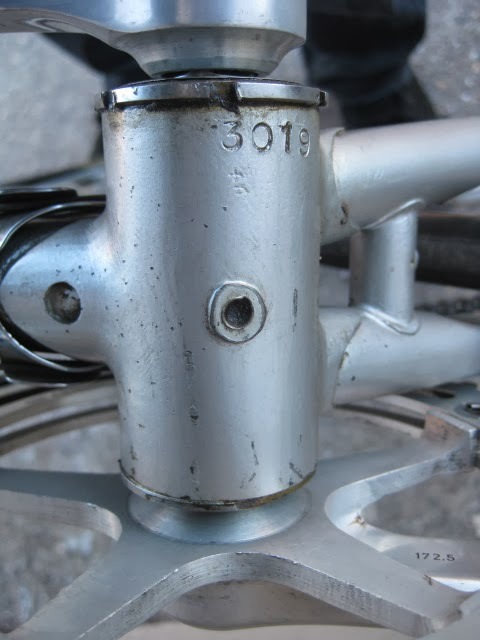 All that is consistent, but then there is the serial number: 3019, which puts it in the 1970's. 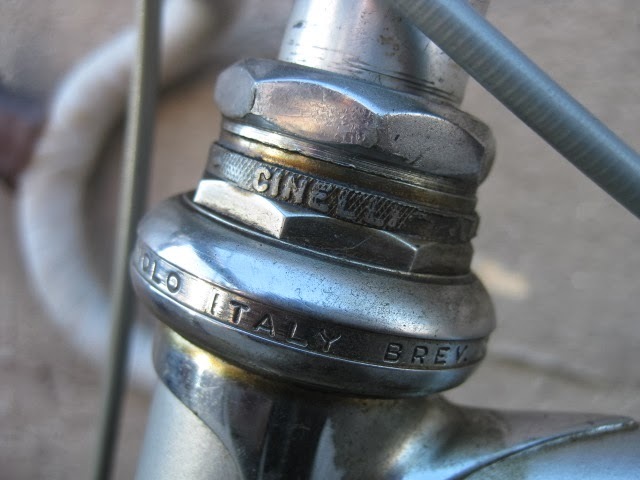 I have been told that Cinelli serial numbers can be all over the place, so I am concluding that it resides in the early to mid 1960's. Some of the components are pretty cool as well. 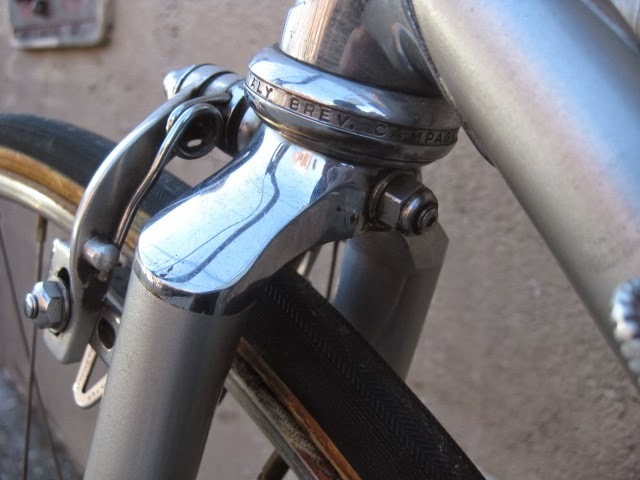 It is equipped with first generation Campagnolo Record brakes without logos which were introduced in 1968. 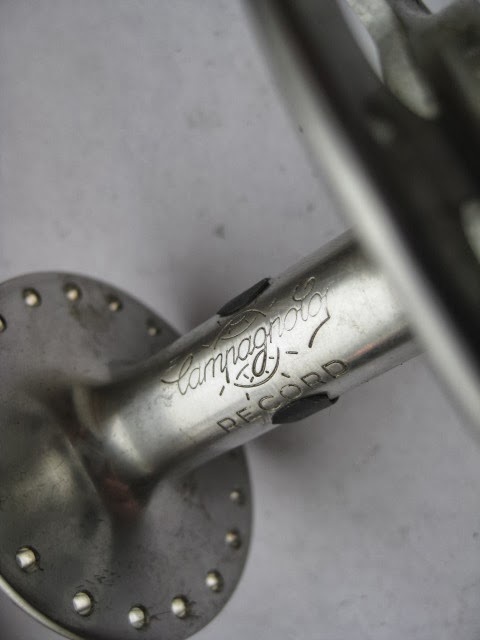 It has a 144 BCD Campagnolo Record crank set without a date code. The 144 BCD was introduced in 1967, replacing the 151 BCD. 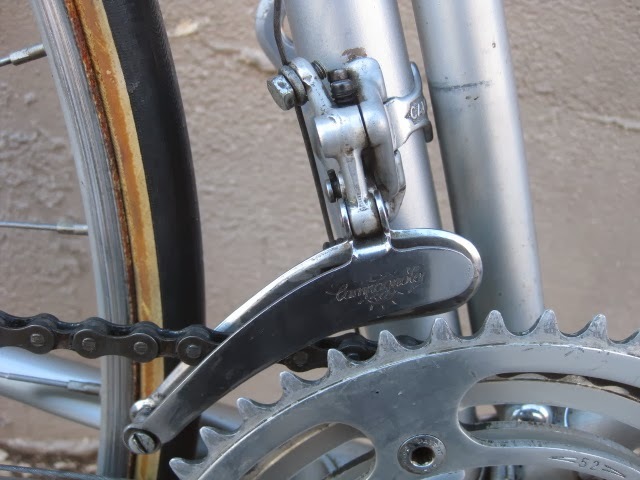 It is equipped with the alloy Campagnolo derailleurs, which were introduced in 1967. 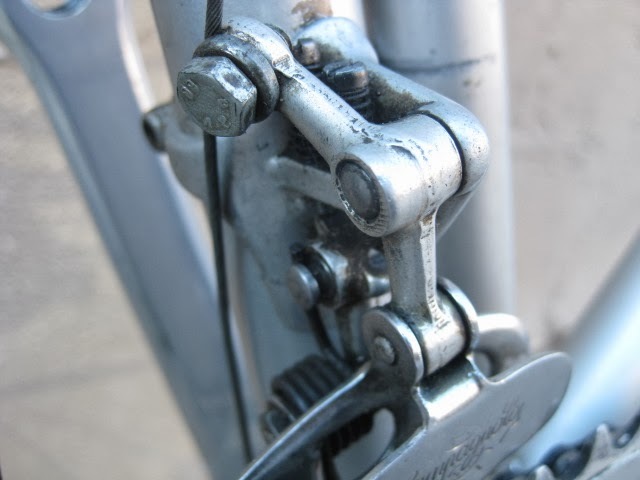 The rear derailleur only is stamped "patent", no year. 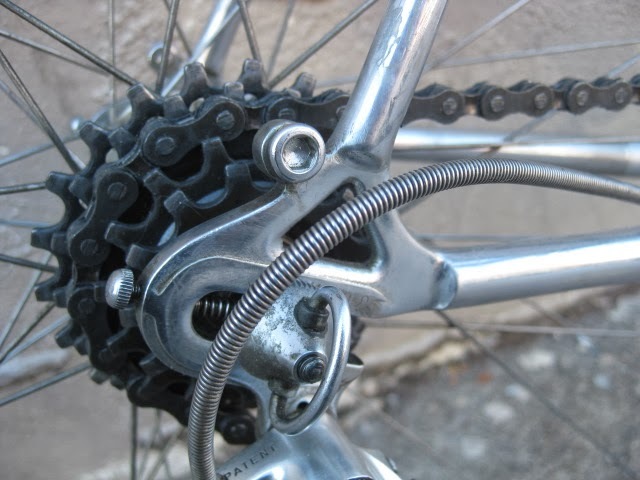 The front derailleur does not have the lip that the C.P.SC. demanded in the late 70's. 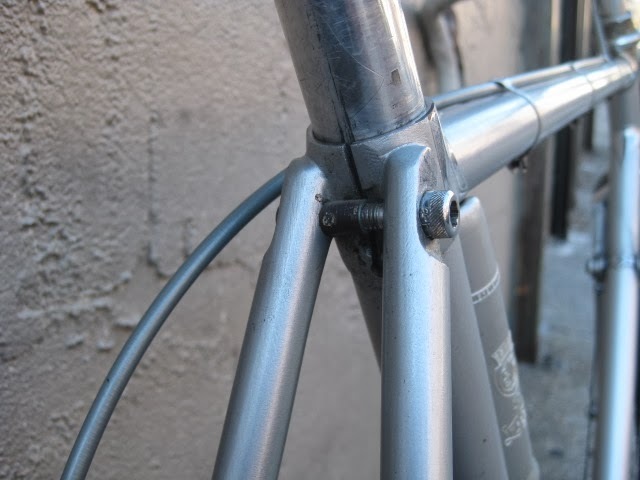 Also, no circlip holding the arms on, pressure fit. 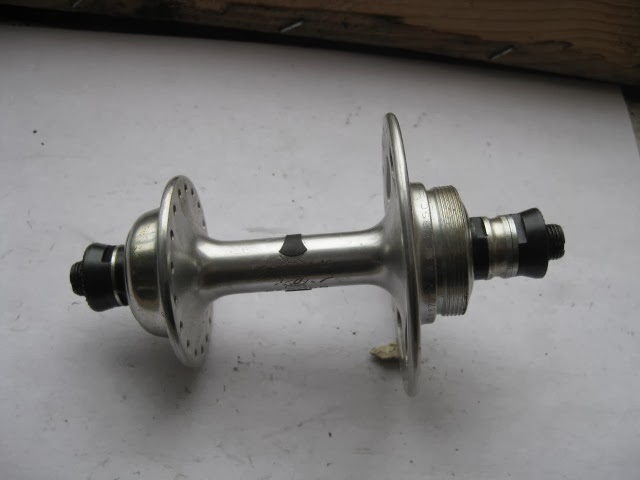 Also of note is the steel Cinelli headset spacer, they are quite rare these days and this one is in great shape. Usually they were discarded by mechanics, so few survive. 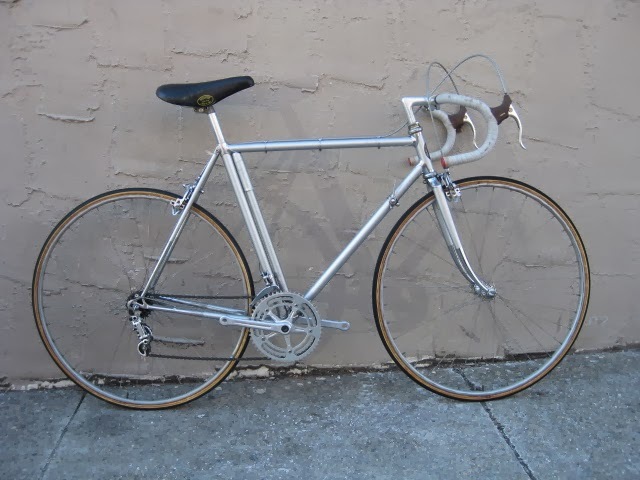 I also like that the bike has no decals, very non-descript, and lets not forget the classic Cinelli silver paint, a personal favorite of mine. So there you have it, the epitome of classic Italian racing in great original condition, enjoy! 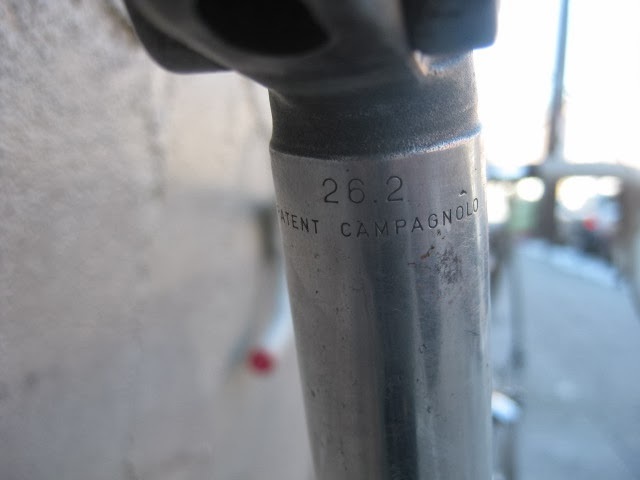 Labels: Campagnolo Cinelli, cool shop bike, Ron Kitching, S.C.
Today I offer this really nice unknown track bike for sale. 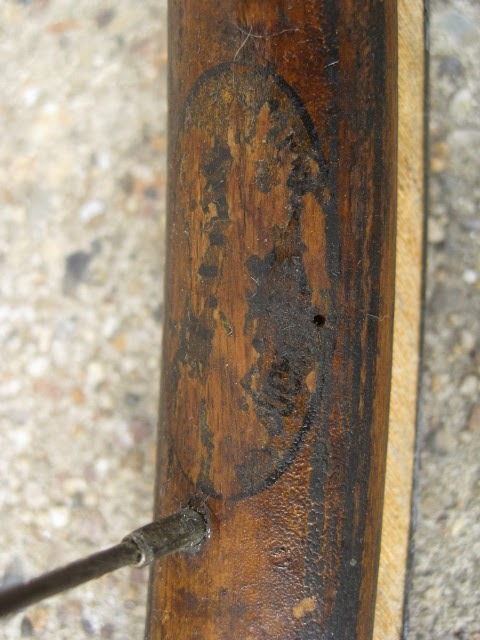 The frame appears to be British. Measurements are as follows. 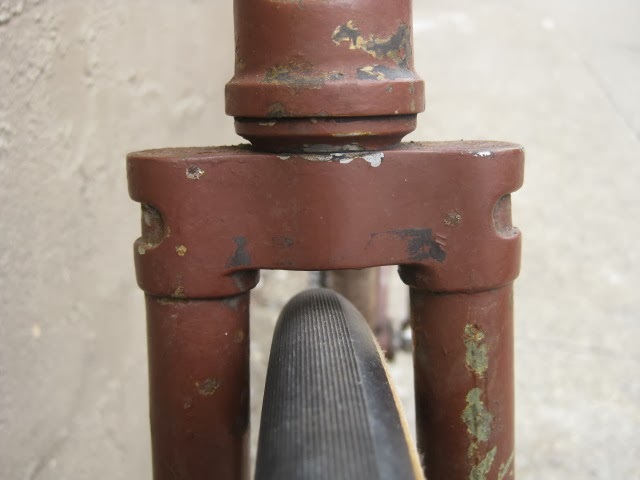 Seat tube is 57cm center to center. Top tube is 58cm center to center. 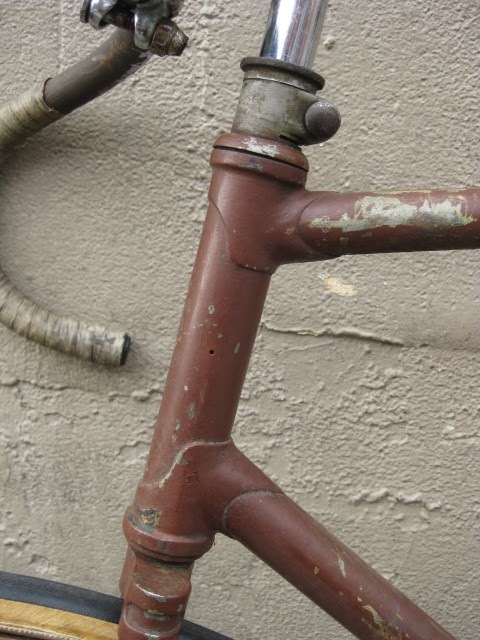 Stand over height is 33 inches.BSA bottom bracket shell. 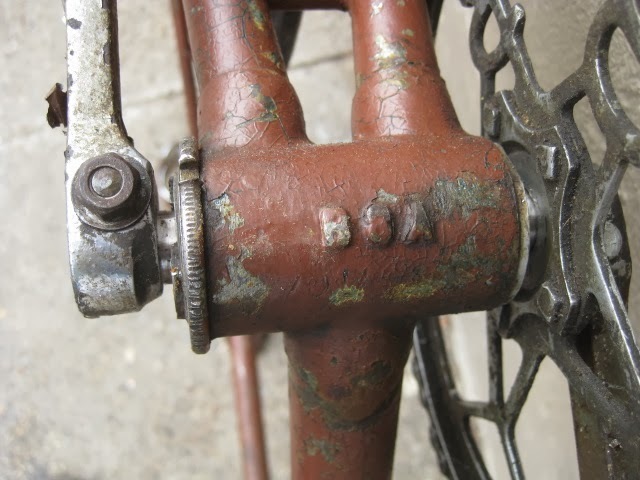 Nice early fork crown. Integrated head set cups with head clip style head set. 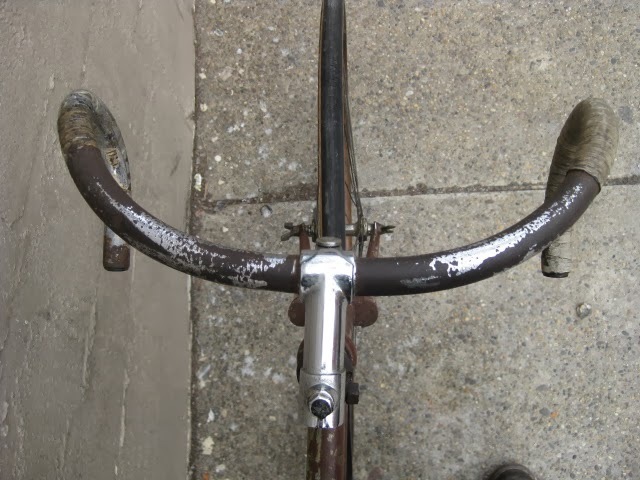 Frame has no dents and is straight. Obviously has been painted "ruddy" brown. 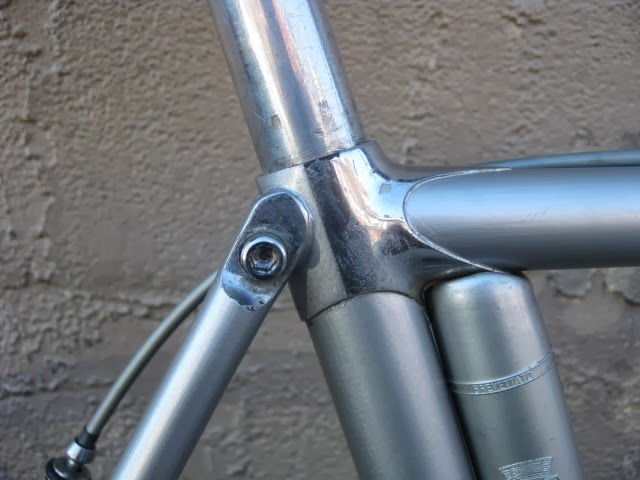 Two holes in head tube for head badge. 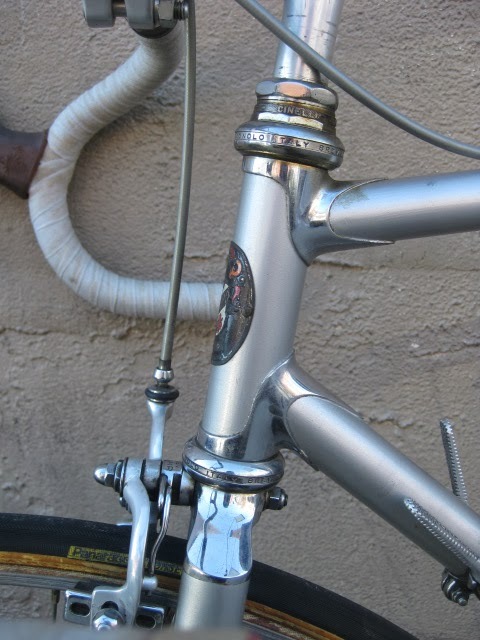 Nice lugs somewhat filed. Components are as follows. 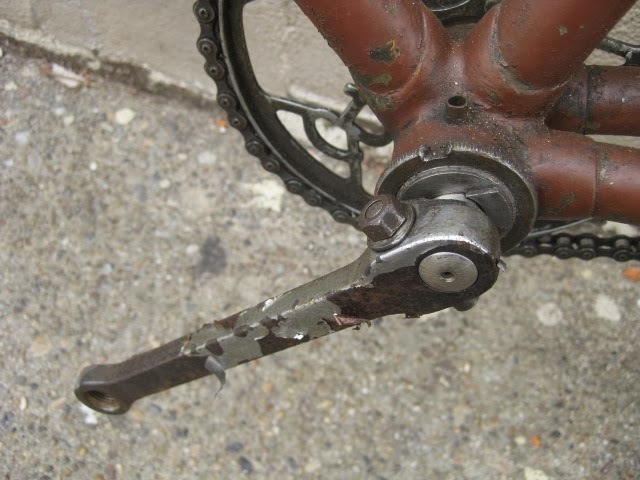 BSA inch pitch cottered crank set. 24 tooth chain ring. 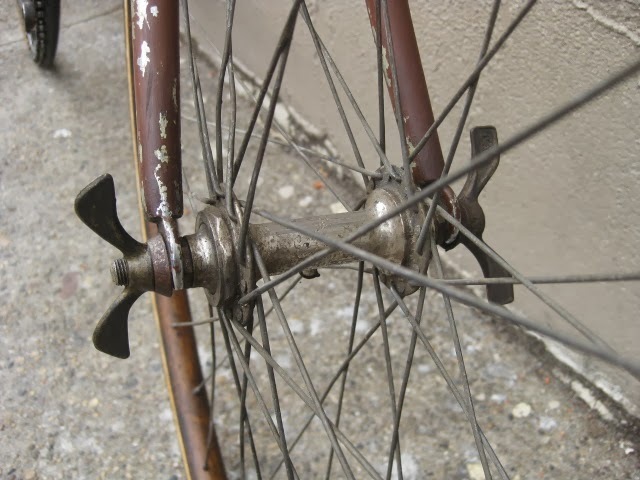 9 tooth rear track cog. 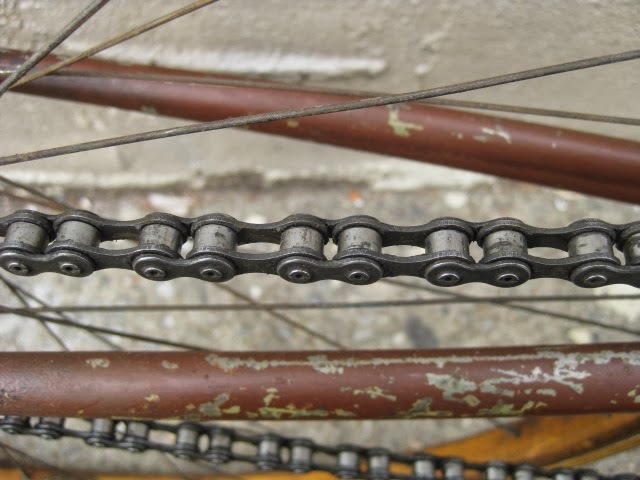 Nice inch pitch roller chain. 9/16" X 20 pedal threads. Unknown rear flip flop track hub. 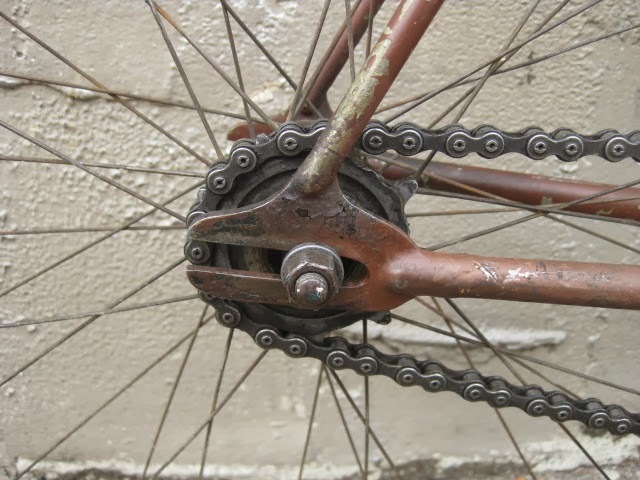 Track threading on both sides. 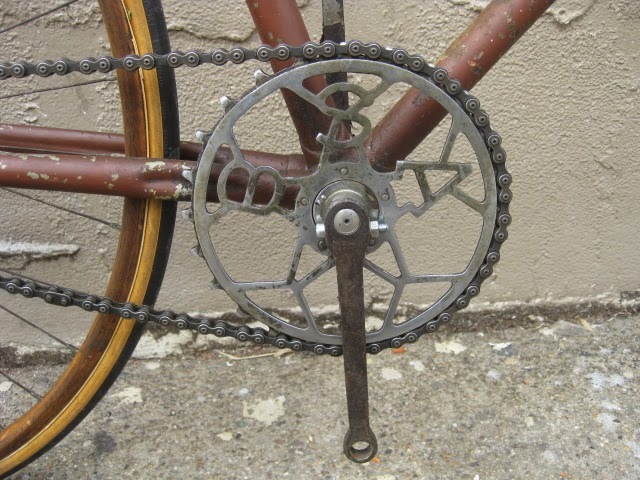 Nice mismatched laminated wooden rim wheel set. 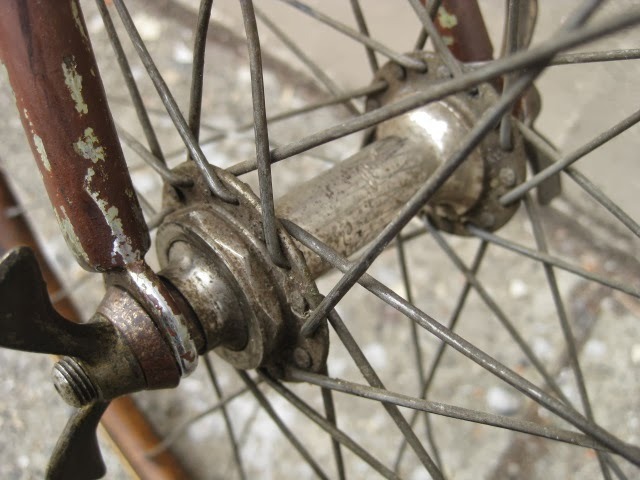 Wheels will need to be tensioned, Some spokes are seized. They have been treated with penetrating fluid and should free up with a bit of heat as well. 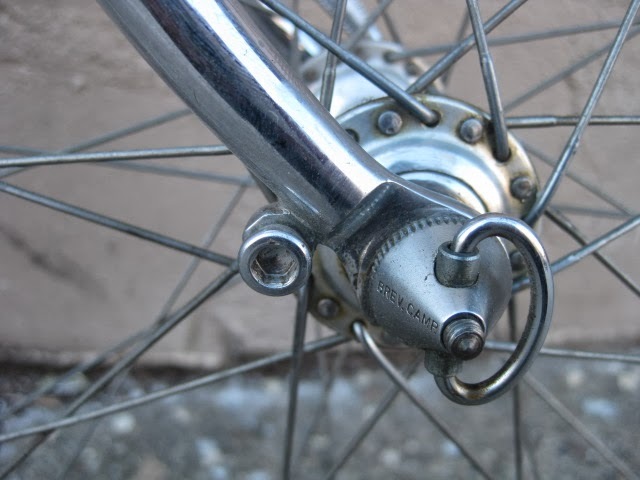 Front hub has some unique features and utilizes wing nut attachment, could be switched out for traditional axle nuts easily though. 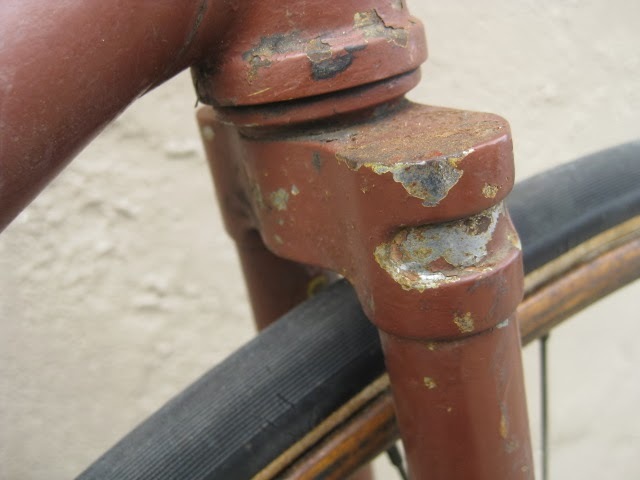 Early track bars with nice bend and lots of patina. They are 37cm wide center to center. 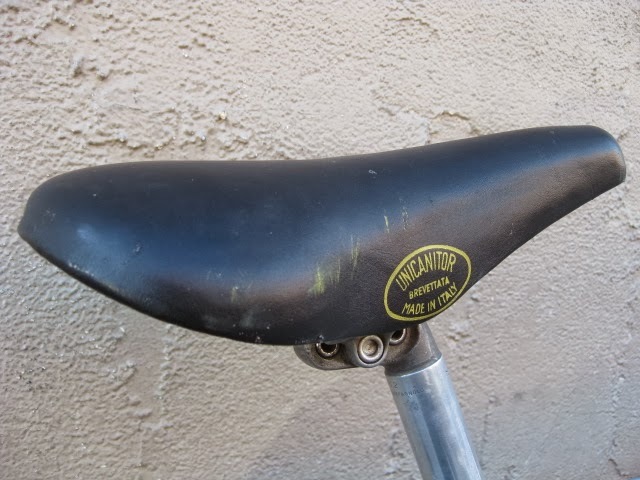 Stem is 75mm long. 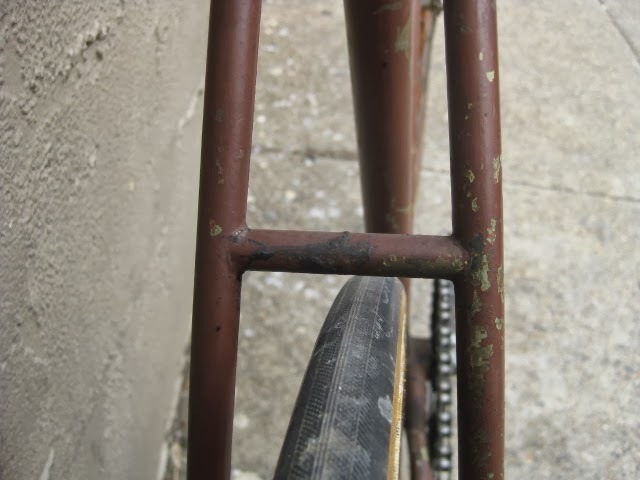 Tubular tires are a bit dry and could stand to be replaced, but hold air. They are from the 70's-early 80's. 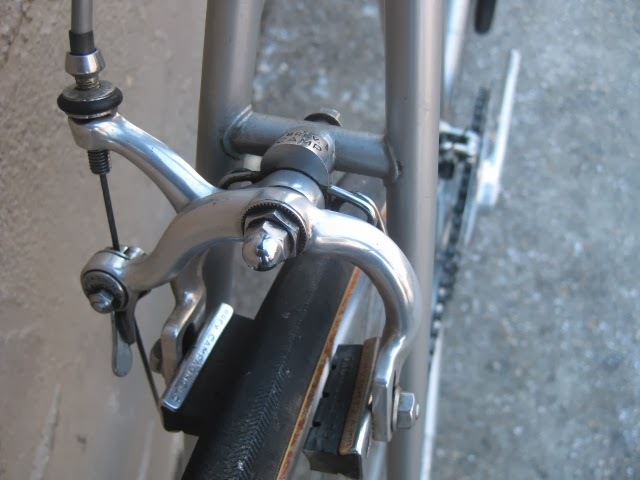 Bike feels overall nice and solid, bearings are in adjustment. 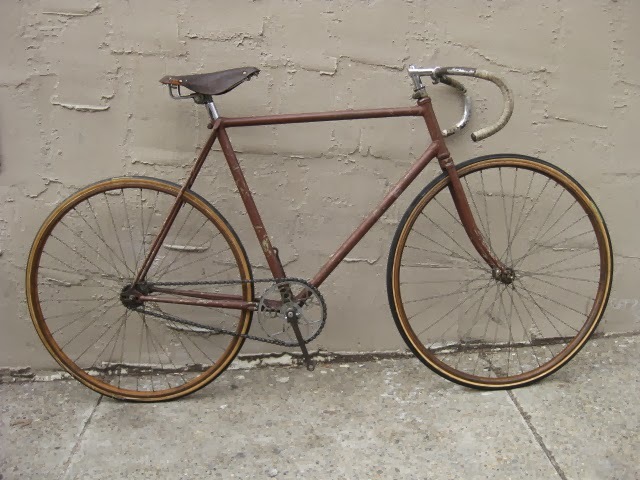 Relatively light weight for a bike of its vintage. 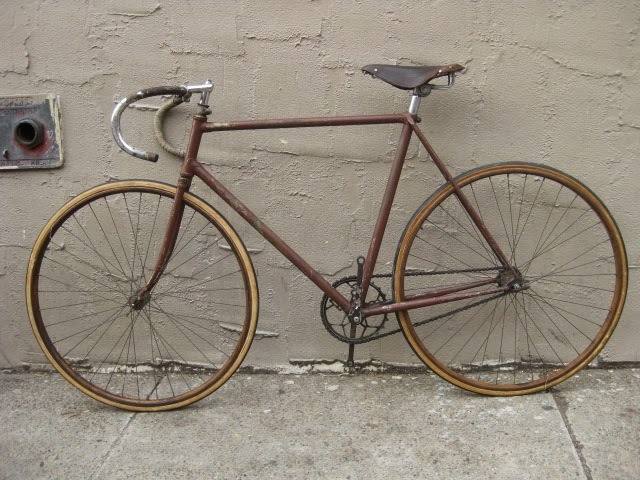 Wish I had more specifics about the frame maker, but it is tough to discern. 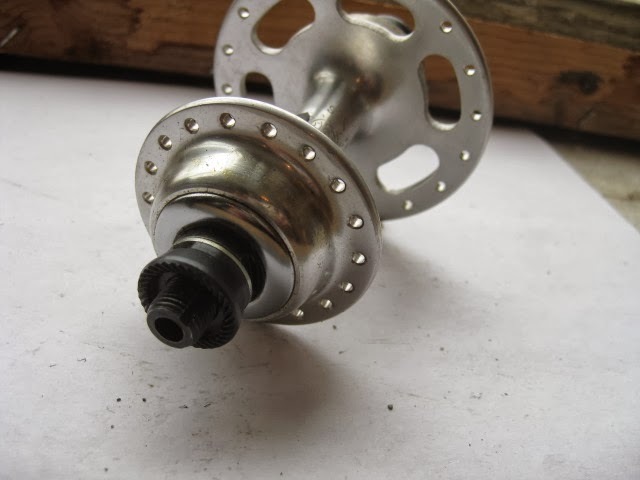 The Campagnolo HI-LO rear hub: A brief history. 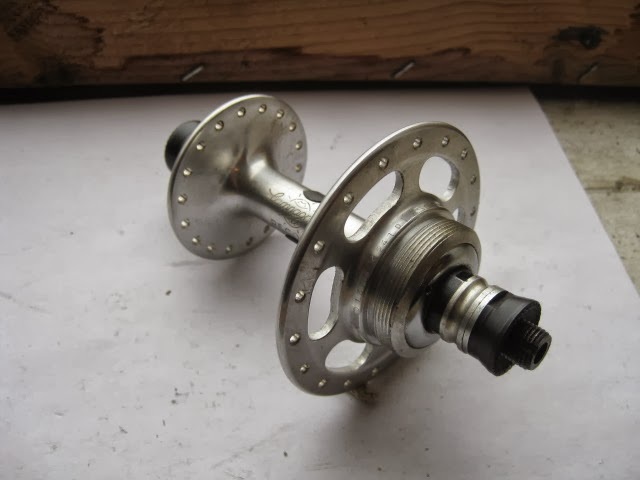 Today I came across one of my favorite hubs, the elusive Campagnolo Hi-Lo rear hub. Ours is NOS and 36 hole drilling. 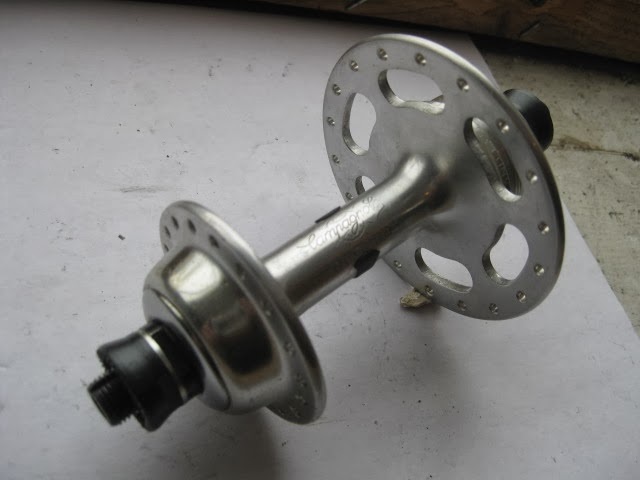 English threading for freewheel. 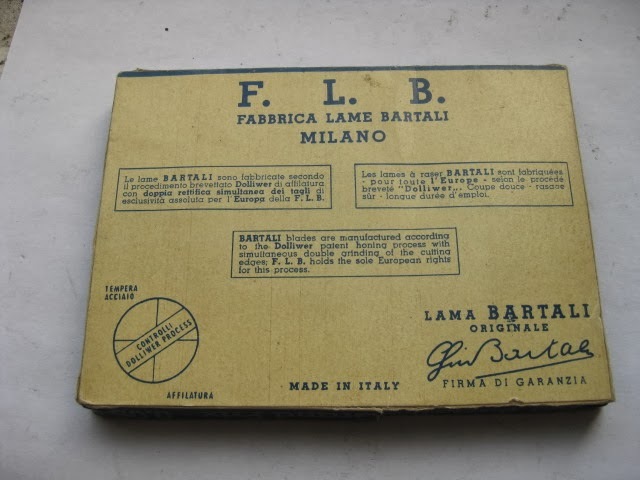 So, the story as I understand it goes like this; They were first made in 1972 for the West German olympic team. 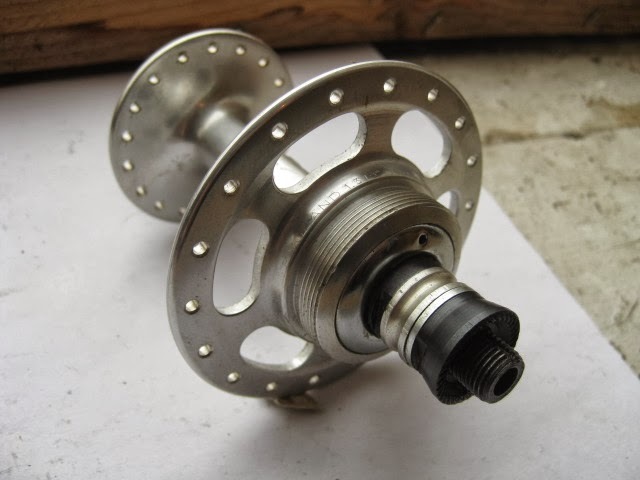 Hugo Rickert, who made bikes for the West German olympic team made a special order with Campagnolo for the Hi-Lo hubs. They created quite a stir at the olympics and started a bit of a rage for them. It did not last long. Euro-Asia had a run made in 1977-1978. 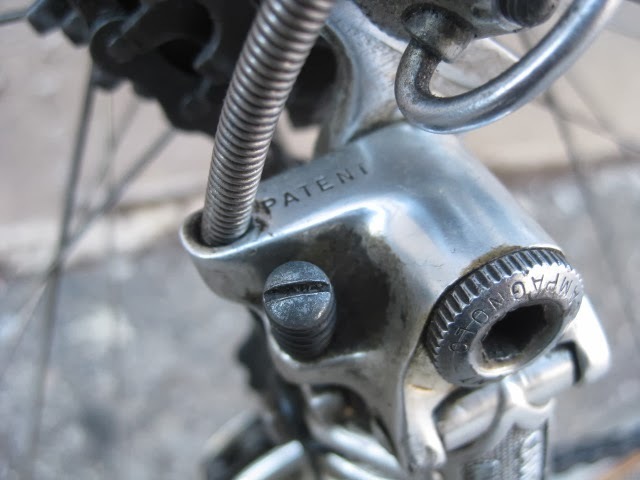 The rumor was that 500 sets were required for Campagnolo to do a run. 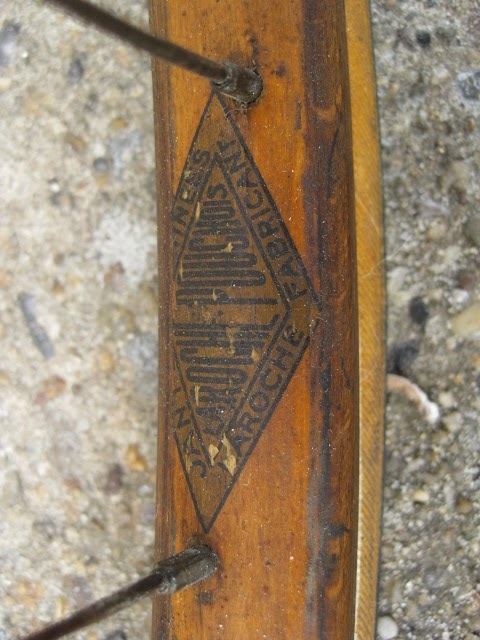 Others surfaced from Germany with the later skewers and typography to indicate threading. One or more of the bigger German importers also got in on the deal. Hubs from 1972 will not have threading described with typography, just groove coded. 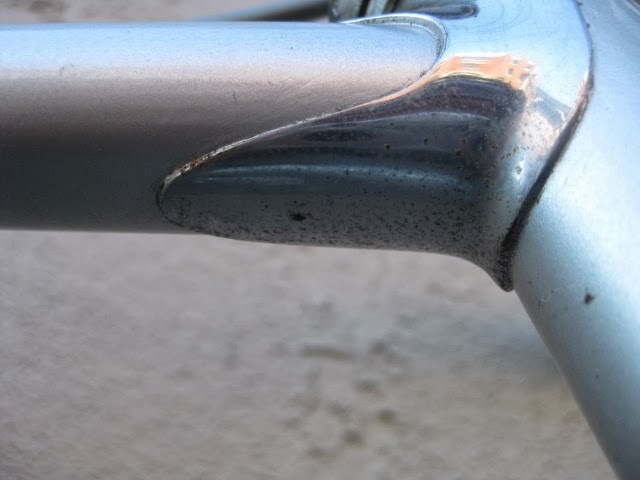 They became available in the 1982 olympic Campagnolo catalog and disappeared into obscurity. Phil Wood also made a version and I believe Hi-E did as well.